The owner repeats the word ‘sit’ endlessly and the dog simply seems to ignore it. But is that what’s really happening? 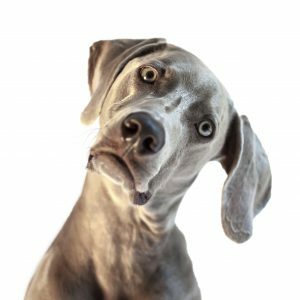 Is the dog being ignorant or ‘stubborn’ or is something else going on in your dog’s brain, preventing him from doing what you’re asking? 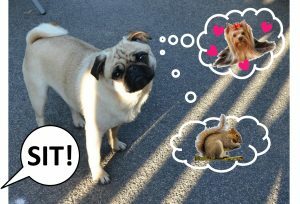 Often, it’s not so much that the dog is ‘ignoring’ the owner, it’s that the dog is too distracted to process the request; perhaps by a passing squirrel or another dog! Sometimes it may simply be that the dog hasn’t learned the cue (‘sit’) well enough to be able to process it in that specific context or with that level of distraction. Perhaps you’ve only practised ‘sit’ in the kitchen or with fewer distractions around so the behaviour ‘sit’ isn’t as solid as you thought. If your dog doesn’t respond the first time you ask him or her to do something, try and avoid repeating the cue again and again. That simply dulls the value of the word; it may even make Fido think that a ‘sit’ is only required if the word is repeated 10 times! Those 10 words made a big difference; they taught me to look at things from my dog’s point of view. To understand what’s going on for him and to see the gaps in our training. Giving your dog time to process your request is important; imagine someone asked you to add up: 432 and 576. Could you give the correct response instantly? I couldn’t! I’d need a moment to work it out (a few actually, maths isn’t my strong point); particularly if I was distracted by a friend walking by or some thing interesting going on right under my nose. Your dog is much the same. Sometimes there is just too much going on for Fido to respond to what you’re asking in that moment. So …. Sometimes being patient and giving your dog a moment to think is all that’s needed. So pause a moment … wait for your dog to look at you and then ask your dog – calmly – one more time and see what happens – you may be delighted by the result! (Plus, you’ll save your vocal chords). So, next time you think Fido is ‘ignoring’ you, just take a moment …. and consider if he needs a little more thinking time. 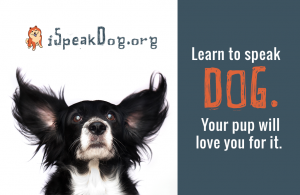 This article was written by Joy Matthews, Dog Trainer at Joyful Dogs. Thanks go to Sophie Goodrich for the illustration.